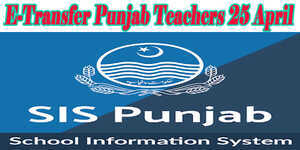 A notification No SO (SE-III) 5.93/2017 government of the Punjab school education department Dated Lahore the 15th Nov 2018 has issued regarding Punjab Educators Assembly Questions Notification for District Education Officer. Kindly refer to the subject cited above, I am further directed to request you to furnish the below-mentioned information latest by 16 11 2018 positively through WhatsApp for onward submission to Competent Authority. 1. 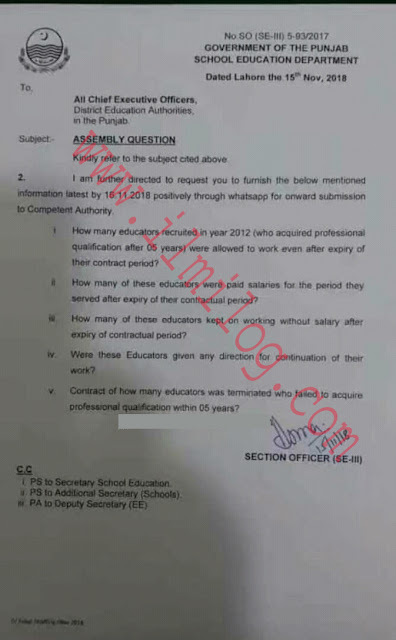 How many educators recruited the year 2012 (who acquired professional qualification alter 05 years) were allowed to work even after expiry of their contract period? 2. How many of these educators were paid salaries for the period they served after the expiry of the contractual period? 3. How many of these educators kept on working without salary after the expiry of the contractual period? 4. Were these Educators given any direction for the continuation of their work? 5. Contract of how many educators were terminated who failed to acquire professional qualification within 05 years?